Whatever variety of corporate entertainment an organization desires is available in Dallas, TX’s. An elegant evening meal and dance to present awards and recognition or a fun and entertaining team building venue can be booked any time of year for visiting VIPs or local firms. One of Dallas’s newest event centers for both corporate and social occasions is Ashton Gardens. Their event specialists assist with theme suggestions, meal planning, audio/visual needs, and set-up for the venue. The experience their people provide keeps the event moving smoothly, impressing all in attendance with the excellent food, the quality technology available and always first-class service. Since opening its doors in 1998, the St. Paul River Centre, established in Minnesota, has hosted over 3,000 conventions and events within its ample show space. It has been rated as the “Best Convention Center” by Minnesota Meetings + Events Magazine three times in a row, and has played host to some major events over the years. It has even accommodated the Republican National Convention, providing space for over 15,000 members of the media. This conference center shares its campus with that of Michigan State University, giving it a very unique feel and a youthful vigor. One of the major perks of the Kellogg Hotel and Conference Center is that it is influenced by very modern architecture and furnishings. With its proximity to the college, Kellogg has a decidedly academic feel to it, utilizing furnishings and décor that provide the perfect marriage between form and function. Located in Detroit, Michigan, the Cobo Center shows you everything that the motor city is still capable of these days. The design of the building could be described as ultra-modern, with an overall feel that will appeal to the aesthetic sensibilities of just about any tastes. The Cobo Center is also the largest of the recognized “Green Venues Michigan,” and the number of environmental initiatives going on here are really a sight to behold. This Oklahoma gem has something for everyone, and is designed with the event planner in mind. The technological aspects of the Reed Center have been designed specifically to facilitate any gathering you can imagine, and it has done all this while keeping its costs low. While some convention halls are located in bustling urban centers, the Reed Center is located in a quiet, peaceful suburban setting. Just outside of Chicago lies one of the few untapped gems of the convention center world. Tinley park offers a great set of options to convention goers and event planners, giving them the ability to create a unique event that is sure to please anyone. Their convention center space is 75,000 square feet of space that can fit just about anything. Located in Collinsville, Illinois, the Gateway Center is a highly regarded, first-class venue. The big benefit of Gateway Center is its perfect location. Not only is it located close to bustling St. Louis, but it is also right near some amazing shopping and dining locations. Being outside of the city allows them to have big, open, tranquil space for your event. At Sawmill Creek Resort, located in Ohio, there is an awesome, rustic convention room that is a sight to behold. The room is known as the Wilderness Hall center, and it can accommodate up to 2,000 people at a time. Its 50,000 square feet of functional, open space make it perfect for just about any type of gathering imaginable. By far, what most people say they like about Wilderness Hall at the Sawmill Creek Resort is the price. It’s the most affordable option in the Midwest if you want actual quality. It may not be the cheapest, and it may not be the biggest, but the Midwest Conference Center just outside of Chicago is one of the most stunningly beautiful convention centers in the country. The place simply oozes class and refinement, with some facilities giving you a panoramic view of Chicago that will take your breath away once the sun goes down. It is very close to O’Hare, and boasts a very flexible convention space that gives you around 35,000 feet to spread out in. A relatively new convention center in Illinois, the DuPage Expo Center is quickly gaining a positive reputation for itself. This is a great location for tech conventions, as the space is very clean and not stifling like other expo centers can be. Opened in 1998, the Frontier Airlines Center is by far the largest convention center on this list. With 188,665 square feet at your disposal, it’s amazing what you can do. It is very popular in Wisconsin, especially for sporting conventions. According to a recent survey conducted by Gallup Daily Tracking, around six percent of workers are employed by the State of California, which goes up to twelve percent if you include local and federal workers. More than sixteen percent of workers in America were employed by the government last year. The state with the highest percentage of government workers goes to Hawaii, which employs over twelve and a half of the state’s workforce. Alaska came second, employing eleven and a half percent of workers, followed by West Virginia, coming in at just over eleven and a half percent. According to the survey, the US states employing the least number of government workers were New Hampshire, with just over four percent, Pennsylvania, with just under four and half percent and Maryland and Ohio, with both states employing just under five percent of workers. Whether inspired by famous movies or celebrity quotations, city nicknames and slogans are a fantastic and informative way to introduce your city to a complete stranger. We all know that what happens in Las Vegas, stays in Las Vegas, but what about other locations across the States? 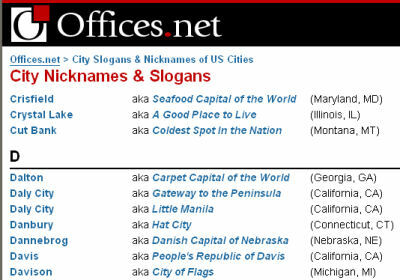 Offices.net has compiled a list of city nicknames and slogans to try shed some light over the historic, social, cultural and – sometimes criminal – situation of each and every state, as well as most of the cities. There are the flavoursome (Hershey, aka Chocolate Capital of the World; Kansas City, aka BBQ Capital of the World), the beautiful (Los Angeles, aka City of Flowers and Sunshine), the scary (Kansas City, aka Killa City; Roswell, aka Alien Capital of the World; Salem, aka The Witch City), the foreign (Ouray, aka Switzerland of America), the odd (Strong, aka Toothpick Capital of the World) the down-to-earth (Plano, aka Play No Games) and the humorous (Telluride, aka To-hell-you-ride). The list of official and un-official state nicknames and taglines shows how over time certain things started to be associated with particular states, became inseparable and widely used, and in many cases treated as the ‘state surname’. Just like there are millions of ways to change a light bulb, apparently there are many ways to misspell the names of cities and states. We have looked at the most common misspellings and decided to compile a helpful resource, containing over 1000 versions of cities we all love to spell correctly, but oh-so-often fail to do so! Amazingly, there are ten ways to misspell Fayetteville, involving extensive swapping of the letters, doubling them where necessary, or trimming them down. Even the shortest of the shortest city names are featured in the list, i.e. Lodi in CA is commonly misspelled as Laudy, Lody, Lordy and Lowdy. Inventive! If you are aware of any more common misspellings for US states or cities please feel free to submit them using this form.